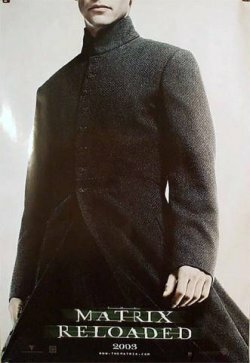 I have to admit, I don't look as good in my cassock as Keanu Reeves...too much beer and pizza and other "Thomistic appreciation of creation" . . .
Update: here's the poster, which a poster mentions in the comments. What do you think? Actually, I hadn't! I was simply watching the movie last night! I was sure you'd gotten your idea from them... Maybe just because I've seen so many of the posters around (at WYD, in my own diocese, online, etc...). But anyways, apparently there are some vocations directors out there who have picked up on some parallels between the priesthood and neo. Apparently they've since come up with a few more posters. "Trinity Pictures presents the Catholic Church a production of the Father and the Son and the Holy Spirit in cooperation with the Blessed Virgin Mary"
"R: Restricted for those radically in love with Christ / Running Time: All Eternity"
"This Faith had not been modified from its original version. Yet, it is formatted to fit your life." Anyways, they're interesting posters for promoting vocations to the priesthood. I think the general concensus among vocations directors (at least from what I've read in articles and from speaking to the vocations director in my archdiocese) is that they are a great tool for promoting awareness of the vocation but they're not going to be what actually brings people into the seminary. That's not a bad thing though, drawing positive attention to the priesthood is good. Fr. Martin is an excellent priest and a fine man. Those qualities come from his spirit and actions, not his wardrobe. I've known seminarians and priests who wear cassocks who wouldn't recognize the Gospel of Christ if it hit them across the side of the head. What a priest wears is immaterial, unless it follows the advice, "Induimini Christum." We will have more priests when we change our society to value the virtue of service to others; until then, all the hokey posters in the world won't help. Just for trivia on the matrix vocations poster... instead of numbers running in the backgrounds, it's the "Salve Regina" and the "Ave Maria" in Latin... you have to actually see the poster in real life to figure that out though. 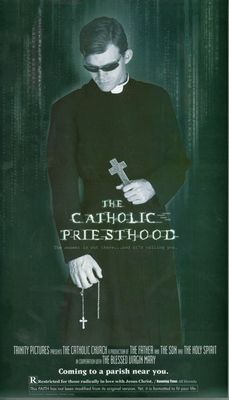 As for the role of the poster itself, I agree with you Marc Anthony that it does not do justice in depicting the priestly vocation, but what image can? The Eucharist I suppose. I agree that it's not the cassock or the rosary in hand that makes the heroic priest, but rather the practice of heroic virtue. I don't think the posters are bad per se, they're fine for drawing attention to the discernment of one's vocations. Your vocation is a gift for God, whether you see the poster or not, one has a particular vocation. These posters won't give people a vocation to the priesthood, but it may prompt them to discern their vocation in life, which is a good thing, regardless of whether they have a vocation to marriage, single life, or the priesthood (or religious life). I had a very interesting discussion of this poster and another on my blog back in August--17 comments, which I think is still the record for a single post on my blog. If you want to check it out, it's in the archives, August 2. Ummm cut out the beer and pizza and lose a stone or two get your ears pined back and drop your I.Q. by half, become as animated as a stick of wood and you too Fr. Fox could be just like Keanu Reeves. I'd just like to point out the comments to the previous post. Having young, intelligent, articulate (not to mention hot) priests is also good for increasing vocations. Fathers Fox and Tucker are role models not just by what they do, but by who they are. They show boys that priests are normal men who chose to serve God. Growing up, I wanted to be a priest because I wanted to be like the wonderful priests in our diocese. I didn't understand for a long time why women couldn't be priests because I had never seen or spoken to a consecrated religous. Maybe my life would be different if I had back then. It still gives me a thrill to see people in religous garb at the airport or in the grocery store going about their daily lives. It's a reminder that we are each called to our own vocation every moment of our lives. "Ummm cut out the beer and pizza and lose a stone or two get your ears pined back and drop your I.Q. by half, become as animated as a stick of wood and you too Fr. Fox could be just like Keanu Reeves." The person in the posters is an actual priest, not just a model, and I doubt he has half the IQ of the average priest and I think his passion to draw young men to the priesthood is an indicatioin that he's much more animated than a stick of wood. Hmmm. I learned an important principal in my years in Al-Anon that applies to this situation, and to vocational promotion in general. The principle is expressed in a slogan: "attraction rather than promotion." The idea, however, is not to plaster posters of attractive priests all over the place. That is what constitutes promotion. Attraction is when a good priest does his job and visibly enjoys doing it. What does it say about the respect our vocations directors have for their clientele if such appeals are considered optimal? Apparently there are more posters out there. I don't want to overkill this discussion though. The wierdest thing just happened. I am in the middle of one of the largest crises I have encountered in my life. It is serious and I mean serious. I typed "alcohol abuse assistance in Piqua ohio" into a search bar out of total despiration, and the blog for my new parish priest came on. No kidding! I think I have lost my mind after all. I am torn here. I know this man. I respect this man. He is a fine man and the answer to everyone's prayers. What if he really is a source that can help! What if I approach him about all of this and all of a sudden even he ends up having no respect for me whatsoever! I have had this problem for about six years and I am tired of the problem! I don't even drink! It is destroying my family! What should I do? Is there a way I can approach my pastor and try to explain my situation and ask for help? How do I do this? I have no insurance and I am afraid I will end up being told to go get a counselor and I can't afford one. It is actual;ly even more complicated than that, but , oh well... Eeeeeek! Maybe you should contact him. That really is sort of wierd. I just did the same thing on my laptop. Something happened here. I don't understand it either. I don't mean to be rude, but if you are reading this at least you will understand you are not the only one, so you really can't be that bad. Nothing can be that bad. People just make you feel that way. Wow. I feel the same way most of the time. and as we heal, we accept the obligation to pass on that peace. Reverend Father, you are amazing!